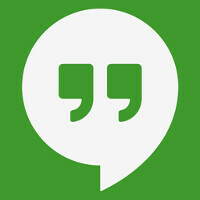 Google has updated the iOS version of its Hangouts app. By adding a native iOS share extension, files and photos can be shared a lot easier, without using the Hangouts app. Activating the extension while in Safari or in Photos will allow you to share URLs, photos and videos. A new menu lets you select where the shared content is coming from, as well as allowing you to decide where it is going. Another new feature that comes with version 9 of Google Hangouts for iOS will freeze video sharing during calls once the iOS Low Power Mode is activated. The battery saving setting for the iPhone will darken your screen, put your phone to sleep faster, disable background updates for apps, and throttle the processor, all in the name of getting an extra three hours of battery life. Google Hangouts for iOS is a free app. You can install it on your iDevice by clicking on the sourcelink. The best photo sharing experience is on Google Photos with photo/album links. Best thing since sliced bread. I also download and use Google photo. I like the idea of unlimited photo storage. Awesome, finally. I freaking love Hangouts, the rest is garbage expect for iMessage. Google's is finally updating it's lesser used iOS apps like keep and Hangouts.